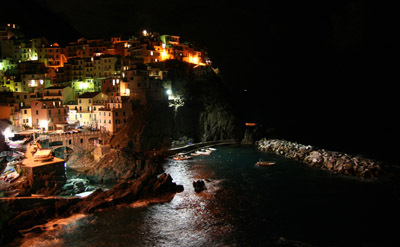 Last night, Christian and I went to Manarola for dinner and to take pictures at dusk. 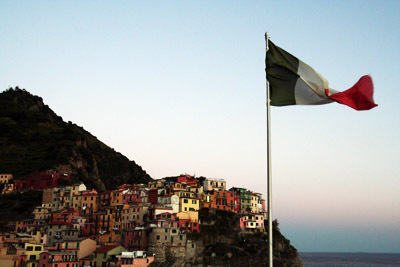 Christian is obsessed with Manarola because of some picture of the town he has at his home back in Philly. It's a shot at night with the moon reflecting in the harbor and is apparently quite the conversation piece. He's talked non-stop about wanting to take a similar picture since we got to Cinque Terra. We hopped off our train and ran around and got the shots, then we had an excellent dinner, perhaps the best so far. 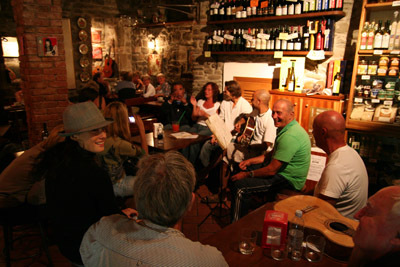 It was at a restaurant on the main drag in Manarola. We ate steamed mussels, and fried calamari, squid and prawns for the entree. Mmm... local seafood. We heard singing across the street from the restaurant and went over to hang out at this bar that had an open mic going. We sang along to mostly American songs. Christian was quite shitfaced by this point and wanted to stay at the bar all night. Fortunately, I was my paranoid, conservative self and made a move to check out when the last train left for Monterosso -- in just 20 minutes. I drug Christian out of the bar and we got to the train station on time. We met up with Dan and Jesse again at the only bar in Monterosso still open after midnight. 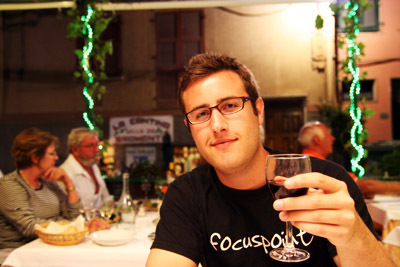 Dan is a Brit and the number 15 windsurfer in the world. Jesse is a totally hot, dumb blonde from California who used to live in Cinque Terra but now lives in Maui. We played cards and drank the rest of the night.